We carry hundreds of pre-Owned Games Workshop products, including Warhammer 40k Miniatures and models. We also carry a limited supply of Terrain, and Scenery. We do not sell any new Warhammer 40k Figures. Any items that are in box we have aquired second hand and any single miniatures come with all pieces. Warhammer 40k is a science fiction Miniature Wargame set in and around the year 40,000 AD, in a twisted dystopian millennium. You can choose to assemble and paint from thousands of models to form your own unique army for the forces of Order or Chaos. This table top wargame was created in 1987 by Rick Priestley, it is currently on its 6th edition and constantly growing. Expansions for Warhammer 40k are released frequently that give rules and guidlines for new factions. 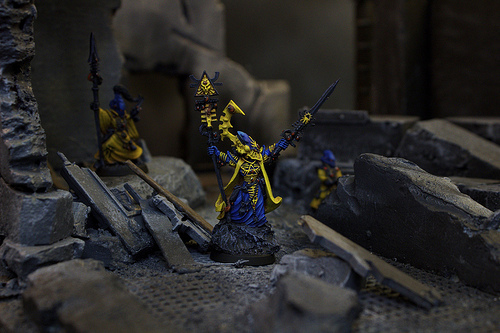 Blue Table Painting is always up to date on these releases and offers the unique ability to paint your custom army at high levels to ensure the best gaming experience possible.